Go to 'Settings' och Master level, go to 'Workflow settings' and click on 'Tracks'. Depending on your company workflow settings, it is possible that the payroll run is automatically executed. Check your workflow settings for this. 1. When 'Execute Payroll Run' is ticked, you can process the Payroll run. When it is not ticked, you can activate this action by clicking on the action. 2. When 'Execute Payroll Run' is ticked for automatic execution, you do not have to perform any action to process the payroll run. You can choose to have this action performed automatically or manually. More information about the workflow settings can be found on our support page. The explanation that follows assumes the manual performance of an action. When you have ticked automatic processing of the payroll run, you do not have to perform these actions. Executing a Payroll Run via the Workflow tab. Go to the 'Workflow' tab. 1. Open the workflow of the company by clicking on the triangle. 2. Click on the arrow to process the payroll run. Check the data and click on 'Continue'. 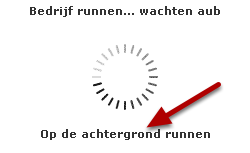 Please note: the run description is not visible when the employee downloads the payslip. Check the details and select, if required, which employees must be processed. Then click on 'Continue'. You will see an overview of the employee details and company details with notifications, if any. The payroll run will now be processed. You can select to run the company in the background, so you can continue to work in the system. 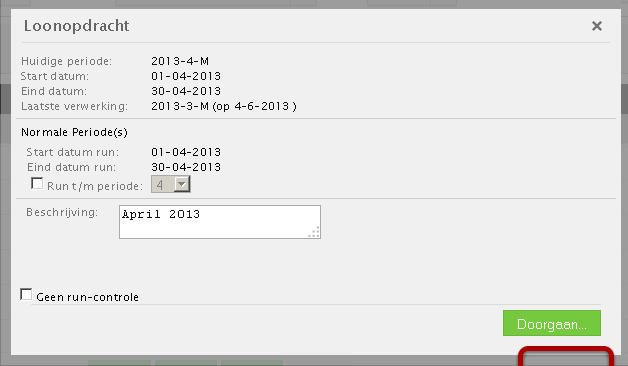 In the workflow overview you can see from the green block that the payroll run has been processed.